Recently, the death of Sudan, the “last” northern male white rhino housed at the Ol Pejeta Conservancy in Kenya, was met with the expected paroxysms of grief around the world at the “loss of another species”. This is a classic case of an “extinction” that has been carefully contrived. I have no doubt many white rhinos still remain in South Sudan, and in a year or two, a “saviour” (most likely a Caucasian) will “discover” them to much fanfare and acclamation. This is not a new phenomenon. In 2016, a population of over 100 lions was “discovered” by Hans Bauer of Oxford University in Alatash, Ethiopia. The same year, Iain Douglas-Hamilton of Save the Elephants “discovered” an adult elephant that had ventured across the border from Kenya into Somalia. Neither of these phenomena could have existed or occurred without human observation, but it only made news when they were observed by Caucasians. This is typical of the conservation discourse in Africa, where not one of the so-called “authorities” on any wildlife species is black, nearly a century after the establishment of formal conservation structures. This can only be caused by two circumstances—either black Africans have no interest whatsoever in their natural heritage or they have been deliberately excluded from the discourse on conservation policy and practice. The story started making headlines in 2009, when Sudan and a few other rhinos were transferred from a zoo in the Czech Republic to Ol Pejeta. The world was then told that the last 20-30 rhinos in the Garamba National Park in Congo had succumbed to the civil war in the 1990s and early 2000s. The truth is that in the 1990s, Garamba had become unsafe for the expatriate managers, and they left. 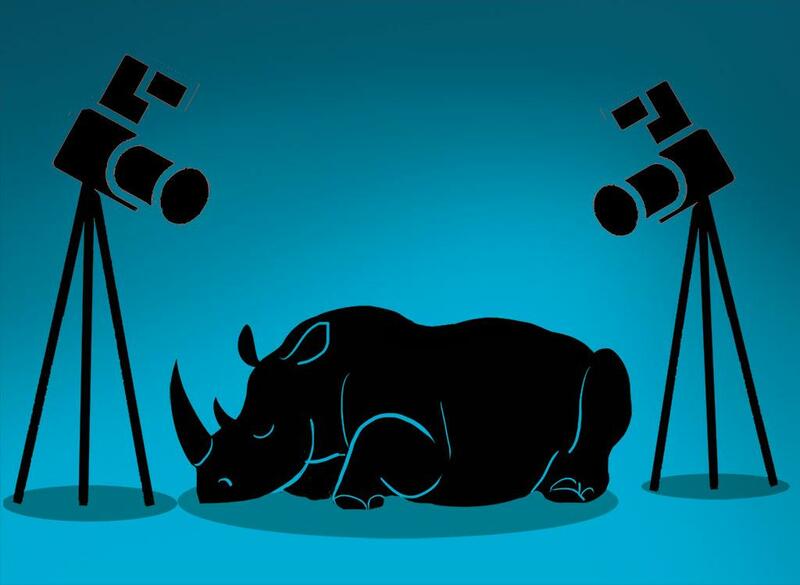 Any inference on the fate of the rhinos after they left is based only on the hubris and belief that wildlife cannot survive without them—the expatriates or the Caucasians. After the rhinos came to Kenya, the media was fed with stories that these were the “last” ones, when the fact is that they were just the last ones under the control of Caucasians. Tens of millions of dollars were raised and spent by Ol Pejeta in the following years trying to make these “last ones” breed, and they were kept in captivity, out of sight, only to be seen by special wealthy and important guests, who could donate financial and social capital. About a week before Sudan’s death, Ol Pejeta authorities announced about how Sudan was terminally ill and its survival was bleak. When the end came, the public grief poured out in the form of donations. Coincidentally, the CEO of Ol Pejeta was in London, where he made a well-prepared appearance on BBC. Except that the timing wasn’t really a coincidence, when one considers that Sudan was actually euthanised during this period. The grieving public was then offered a glimmer of hope: genetic material had been harvested from Sudan and could be used for in vitro fertilisation with ova from the surviving females. The cost of this new project would be US $9 million. The two remaining females are Sudan’s progeny, so even if the fertilisation happens, it would produce an inbred offspring which would be expected to procreate with its own parent. To the logical mind, this is not viable, so the primary aim would, therefore, be to raise funds out of a contrived tragedy. Though millions of dollars have been raised for rhino conservation till now, there has been no attempt to do surveys of their ranges in northern Africa. None of the ecological protocols that precede declarations of extinction have been done. But that doesn’t seem to matter, as long as we are grief-stricken enough to keep our purse strings open to finance the two rhinos that are privately-owned. But if we examine the history of conservation practices and priorities in Africa, it is likely that the money for in vitro fertilisation will be wasted. Why would you publish this cynical piece of speculative fiction that libels the good work of Ol Pejeta? If you accept what it says, then you would have to apologize for the articles you have published about Sudan and the other remaining Northern White Rhinos, all of which were premised on the fact that these were the last remaining population of the subspecies. The story of the loss of Northern white rhino is very long and punctuated by on at least one occasion poor responses from American Zoos and some of the African people in DRC around Garamba when, over 20 years ago when there were 30+ NWR, very serious attempt were made to take some zoo NWR and some Garamba NWR to Kenya to create a second viable breeding herd, given the wars in that area of DRC. The DRC wildlife authority had agreed to commit some rhino but the American zoos refused to commit animals to such a second wild herd in Africa, and some people around Garamba also protested vigorously. That was the worst failing for the NWR saga. Such a breeding herd would have saved the subspecies and allowed NWR recolonisation of several African countries when safe conditions returned. Regarding surveys for rhinos in Sudan, DRC and elsewhere in N Africa, on many occasions in the 80s, 90,s and 2000s, when reports of rhino came in from local African people in such areas, extensive surveys were launched to get further evidence and determine rhino range and numbers, and also initiating plans with local African governments and community authorities to put in protection and if needed plan a sanctuary for such rhino. Committing large funds to rhino rescue has to be backed by proper evidence and realistic action plans. In most cases either the field surveys (by experienced field rhino experts working with the local authorities and people, and the best available African trackers) never produced any convincing evidence, or the government / local African authorities failed to put any protection in the area and failed to act to protect any rhino if they were present. E.g. the final disappearance of the D.b.longipes from Cameroon was basically due to government neglect after many field surveys, detailed plans for emergency sanctuaries, and attempts to get authorities to take action on the ground. The last rumours of rhino there from local people turned out to be hippo prints (some deliberately made to try and fool surveyors). There were occasional rumours of NWR in south Sudan up to a few years ago. Given the waring factions operating there, including the Lords Resistance Army who funds itself from blood ivory and who killed the most of the last remaining Garamba rhino, working from Sudan, it is very unlikely any NWR remain there, and very very difficult/dangerous to put in any form of major survey, or do anything about any survivors if found. It is indeed sad and wrong if African people or ecologists are "sidelined". Conserving Africa's endangered animals takes - above all - working together (and IS costly). Cooperation between scientific experts, governments, Private landowners, African communities and NGOs has to happen to ensure the future of rhino in any African country. Great successes in exactly this cooperation HAVE INDEED promoted rhino range expansion in South Africa, Namibia, Zambia, Malawi, Tanzania and Kenya, and just recently the return of rhino to Rwanda and now Chad! Where government will is lacking, efforts seem to fail, but where all relevant entities work together, rhino can be brought back to restock the great wildernesses of Africa. That’s the plan.